Spending some time away from the world of theatre blogging, what better time to come back than to spend a passionate night with some knights at the Arts Theatre. Oh what a (k)night! Knights of the Rose is a classic rock musical of Shakespearean proportions. Featuring the ultimate playlist including legendary ballads and timeless anthems from Bon Jovi, Muse, Meat Loaf, Bonnie Tyler, No Doubt and many more. In this epic tale of love, betrayal and sacrifice, the noble Knights of the Rose must defend their House and their honour. Even as the chivalrous Knights return from a glorious victory, a greater threat against the kingdom stirs. As they face the greatest battle of the Age, and betrayal threatens to tear them apart, can true love and honour triumph? Knights of the Rose has the petals of love, thorns of war, and the bud of honour. The characters fall in love whilst being weighed down by the duty for King and country. The instant pairings establishes the winners from the losers, knowing the drawbridge of betrayal looms. Amongst the constant cravings for battle, the cast arise as victorious songbirds throughout the show. An ever-transforming and rotating castle set, installed with creaky steps, the stages dives into the history books. Arches of roses, sometimes hidden, to symbolise the return of romance or the reminder of sacrifice. Perhaps the canoodling in the rose garden can make the eyes roll, but it is cute and cues a song about love. Awww! Swooning for the tall, dark and handsome Sir Hugo (Oliver Savile), he was the knight of the night. For those with dreams of a knight whisking you away from the office desk, he fits the bill. His voice, posture and performance conquers the stage and emerges as a champion. Unknown to him, Sir Palamon (Chris Cowley), who was once his friend, now his enemy, wishes him to meet an early death for a chance with Princess Hannah. Like an episode of Love Island, the love triangle begins. At times, the songs became the ultimate feast for cheese. Lines would slowly build, lead into well-known lyrics and then catapult into song. My naughty little giggle slipped as Princess Hannah sang No Doubt’s Don’t Speak, signifying her potential break-up with Sir Hugo, leaving their future of a recoupling uncertain, otherwise he would be dumped from the castle. BUT what almighty voices the strong cast have. 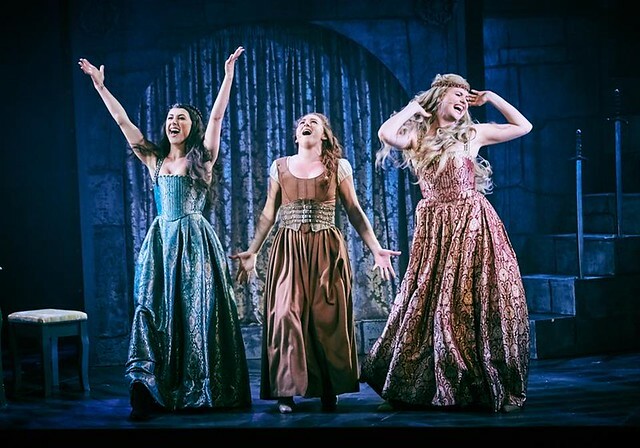 All voices boomed across the theatre with determination and conviction to make the show a success, especially the girls’ rendition of Bonnie Tyler’s Holding Out For A Hero. No notes faltered, just pure song perfection. The cringe was soon forgotten and the cast almost ended on a mic drop every time. Look who’s laughing now, aye? Filled with love and drive, Princess Hannah (Katie Birtill) had some real sassy moments with a top notch voice. At times, Birtill’s bellowed the house down, but I couldn’t blame her with a voice like that in such an intimate space. After all, if you got it, flaunt it! Offering her pearls of wisdom to the merry knights and sharing sisterly love for Lady Isabel (Rebekah Lowings), the ending was destined to be a happy one. However, every story involving knights must face tragic death. No spoilers here. Sir Horatio (Matt Thorpe) adopted the perfect cheeky chappy character, spreading some joy about the place. Comical dancing, quirky smile and a fresh voice, Thorpe earns entertainment value. Trying to impress Lady Isabel (Rebekah Lowings), I was rooting for Sir Horatio to get his girl. He was simply a joy to watch on stage. 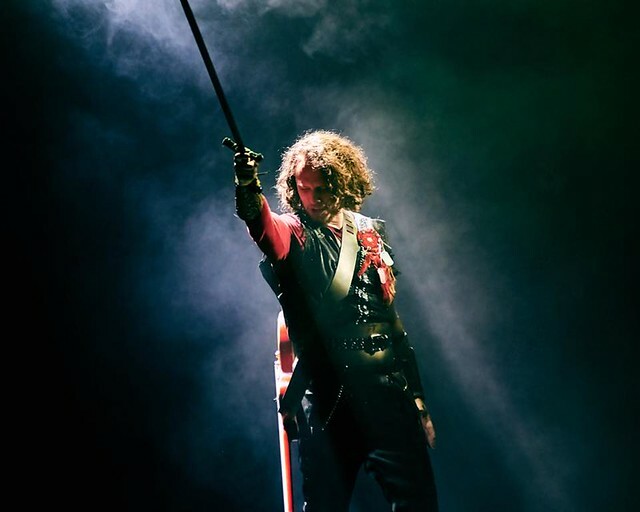 This musical shouldn’t be taken to the laughing stocks as the Knights of the Rose makes an enjoyable night out for those not wrapped up in the seriousness of it all. I admit I’m not a theatre critic, but I do praise the Knights of the Rose for its heroic draw of the sword for rock musicals. With an amazing band, strong voices and performance, this brand new musical should be appreciated for its creative worth and has a longbow of potential. So put your armour on, saddle up your horse (faster than Southern Rail that’s for sure!) and see the show for yourself! Knights of the Rose at the Arts Theatre closes on Sunday 26 August, book your tickets here.